The WineHero wine bottle protectors for travel are designed to keep your bottles, luggage and belongings safe while in transit. Ever find yourself traveling and wishing you had an easy way to bring home a bottle of wine, olive oil, or grappa? I have. In the past I've always put my wine bottle in a plastic ziplock bag and then wrapped them in layers and layers cloths. Then I'd put it in the middle of my suitcase and pray for the best. Although I was always lucky, some of my friends weren't and ended up with red tinted cloths by the time they reached their destination. So we decided that there must be a better way to travel with wine that didn't involve ruined dress shirts. Our WineHero travel sleeve is designed to be leak-resistant with a heavy duty double seal and hook and loop closure. The best part is that our wine sleeves are reusable, so you can travel internationally and always have a bottle of wine stashed in your suitcase. Also, you won't be contributing to landfill. 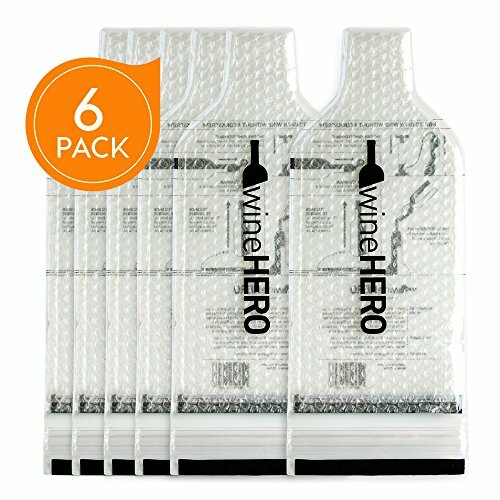 Pick up the WineHero wine bottle protector for airline travel today! ✓ REUSABLE & ECO-FRIENDLY - Stop wasting money on single use wine protector sleeves! With our re-usable WineHero wine travel protector sleeve you will be eliminating unnecessary plastic waste in the environment while protecting your expensive wine. We want you to be the hero of the party! ✓ 100% SATISFACTION GUARANTEED - We think you'll LOVE the WineHero Wine Bottle Protector. Dependable travel accessory for that great wine gift! ✓ PACKS FLAT UNTIL READY TO USE - We know we're not the only wine bottle sleeve available. We also know that the quality of our WineHero bottle sleeve protector can't be beat. Our super flexible PVC plastic ensures our bottle sleeve won't ripe or tear in transit. Best of all, our triple seal closure ensures a completely spill and leak proof traveling experience. ✓ WINE, LIQUOR, BEER, OLIVE OIL, VINEGAR BOTTLES - Whether you're traveling by airplane, rail, cruise ship or bus, you'll be able to bring your wine with you wherever you go. Avoid the nightmare of a broken wine bottle in your luggage by using the WineHero wine protector for your luggage. Always keep a pack in your wine bag, ready to go. ✓ LEAK-PROOF / WATER PROOF WINE PROTECTOR FOR LUGGAGE -Exterior skin with 2 heavy-duty zip lock seals, and an additional velcro enclosure. Inner sleeve to resist bumps. Premium quality bottle protectors for travel. View More In Wine Accessory Sets. If you have any questions about this product by WineHead, contact us by completing and submitting the form below. If you are looking for a specif part number, please include it with your message.